Talking to someone you love about suicide isn't easy, but it could save their life. _beyondblue_ shares their tips on how to approach it. Talking to someone about suicide is hard, but it might be one of the most important conversations you’ll ever have. You don’t need to be a GP or nurse to check in with someone. If a person you know seems to be struggling, reaching out and letting them know you care could save their life. If you’ve noticed a friend or loved one has been avoiding social situations, seems low or flat or just haven’t been themselves lately – it might be time to have a talk. 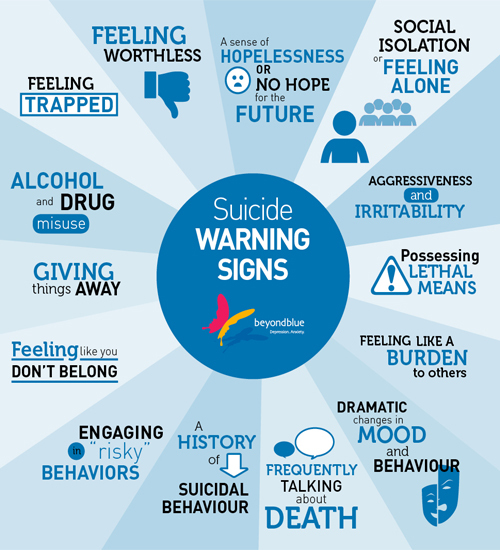 Our partner, beyondblue has developed this chart of warning signs to look out for. It can be overwhelming when someone you care about wants to harm themselves. It’s important to remember that by just having a talk and connecting with them, you can make a big difference. Make sure you choose a time and place where you can talk openly and easily, without getting interrupted. Try to have the conversation at their place, or while doing something together (for example watching bad tv, cooking dinner, playing video games) – these comfortable environments will make it easier to talk. Having a chat while going for a walk or drive is also less intense than a face-to-face conversation. It can be awkward and a bit uncomfortable to get the conversation started, but try asking if they’re OK, share your concern or offer to listen to get things going. You can then ask the more serious questions to see how they’re really feeling. Here are some tips from beyondblue for carrying on the conversation. Are you having thoughts about suicide? Be prepared for the answer to be yes. Take them seriously and acknowledge the reasons they want to end their own life. Find out if they’ve made a plan. This is important. People who have made a plan are at more risk. Have you thought about how you would end your life? Have you thought about when you would end your life? If they are at immediate risk, call 000. If the person you’re worried about is experiencing suicidal thoughts, safety planning can help get them through the difficult times. A safety plan is a structured plan someone can work through when experiencing suicidal thoughts, or crisis and can include items like a list of positive things in their life, music, and contacts to their support network. The beyondblue BeyondNow app puts the safety plan in their pocket, so it is right there when they need it. You can also encourage your friend to send you a copy, so you can offer support through the tough times. More information on suicide prevention and how to talk about it, can be found on beyondblue’s website. For more immediate support, you should contact Lifeline on 13 11 14 or the beyondblue Support Service on 1300 22 4636 (24 hours a day, seven days a week) or through chat and email at www.beyondblue.org.au/get-support (3pm-12am AEST). Can you reduce the effects of PMS?